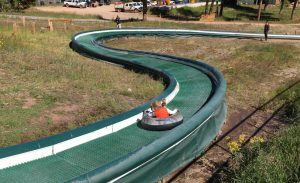 Vail installed a pair of rolling, curving 190-foot mSnow Tube Slides for the summer of 2017. They made use of an existing conveyor lift to offer kids two lane options on either side of the conveyor. They chose to use our forest green bumper system, which was approved for use by the USFS.